This picture is routinely challenged by those who contend that secular reasons and secular discourse in general don’t tell the whole story; they leave out too much of what we know to be important to human life. No they don’t, is the reply; everything said to be left out can be accounted for by the vocabularies of science, empiricism and naturalism; secular reasons can do the whole job. And so the debate goes, as polemicists on both sides hurl accusations in an exchange that has become as predictable as it is over-heated. 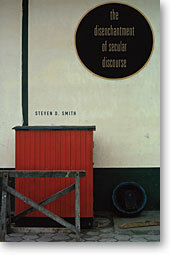 But the debate takes another turn if one argues, as the professor of law Steven Smith does in his new book, The Disenchantment of Secular Discourse, that there are no secular reasons, at least not reasons of the kind that could justify a decision to take one course of action rather than another.